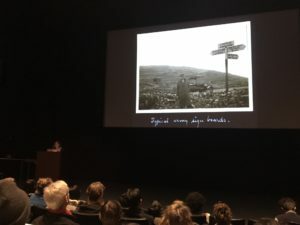 Invited to UC Berkeley through the Art Practice 2018 Regents’ Fellowship program, Emily Jacir’s lecture at BAMPFA was the very first activity on the artists’ agenda while spending time in the Bay Area for the next ten days. With highly politicized works, Jacir approaches themes of belonging through social and political experiences, often referencing and addressing discussions around Palestine, where she is from. Her trans-Mediterranean experiences expand these geographies beyond their physical spaces in a provocative end exploratory matter, allowing the viewer to learn and question some of their own previous assumptions. For this lecture, Jacir selected works that particularly addressed themes related to translation as well as projects in which research was a major part of her creative process. “Translate Allah” (2003), was a great choice as an introductory piece: This billboard installed in front of the Queens Museum, in New York brings a provocative reaction to how the western world translates the world Allah as something other than its meaning as God. Allah in the U.S., for example, as the artists points out, carries a connotation as some barbaric foreign entity from the Arabic world, rather than being perceived simply as the word god in a foreign language. Jacir sees this as a political refusal, thus an important topic to be discussed and highlighted. Jacir’s work as a researcher was well represented by her latest piece at the Irish Museum of Modern Art (2016). Her “survey exhibition” presented in multiple formats, such as sculpture, film, drawings, large-scale installations and photography is a result of large archival and historical investigation that mostly tries to bring to light silenced narratives and connections as a form of political resistance. Jacir displayed some of her findings on connections between Ireland and Palestine through their shared histories of British Colonial Rule. Beyond the objects shown in the gallery space, the artist also presented her sensibility on the museum’s space itself, that were reflected in the site-specific installation “Notes from a Cannon”, using the Clock Tower’s sounds to engage the public about the impositions of others over one’s territory and culture. While she referenced a specific construction in Jerusalem, she also acknowledged the museum’s building and its own histories, as it was once used as a military hospital for the British army. The understanding of the artists’ political view is crucial for perceiving her work. Jacir makes this clear in her piece “Memorial to 418 Palestinian Villages Which Were Destroyed, Depopulated and Occupied by Israel in 1948” (2001). The length of the title is crucial in this case, as she had previously faced reviews where misinterpretations of her work would led to contradictions. Despite being long, the title here does not open the space for ambiguities in that sense. These are some of the examples on how Jacir’s strong and reflective works bring a sensitive view on questions related to inclusion, nationality, belonging… and for this, research and translation are fundamental elements to show others the stories and perspectives that are often hidden, questioning precisely why that status came into being. What is the role of public assembly in our current moment? And to what degree are new models necessary to respond artistically and technologically to our political climate? After a highly successful launch of Arts + Design Mondays @ BAMPFA in Spring 2017, Berkeley Arts + Design is pleased to present a new suite of exciting lectures that explore the theme of “public (re) assembly” from a variety of perspectives. The word assembly carries a range of associations. It challenges us to think about the democratic right to assemble; it recalls the artistic history of assemblage. It provokes us to imagine new systems of arrangement that respond to a digital age. It asks to consider how UC Berkeley might re-imagine the “school assembly” as a site of social transformation. Learn more here.